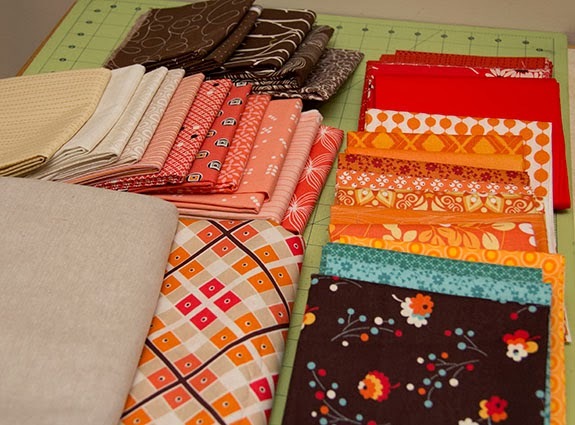 I finally decided on my fabric for the Vintage Quilt Revival Block Along. Back here I mentioned a few prospects. I opted for the Katie Jump Rope fabric as the backing and pulled fabrics from those colors as well as a few blues. I envisioned the blue as a few pops of color throughout the blocks. I am not sure I'm a fan of how it looks in the right block here. I think it's a little too much. I'll wait to see how everything looks when all the blocks are complete, but I may end up altering that block and inserting some red or coral prints in place of those large blue squares. I'll think smaller on the coming blocks. These were simple blocks to start off with, although I made double the work for myself by opting to use a different fabric for each HST rather than using the pairs. I expect to use those extras down the road in other blocks so hopefully the extras won't be wasted. I was able to use the same orange HST in these blocks by making them for the right block first, then trimming them a bit and using them for the left block next. Linking up for week 1. Love your fabric choices! I haven't picked my fabrics out yet...still waiting for my book to arrive in the mail, so I'm going to be a bit late getting started. Your blocks look great! It's going to be so pretty!! Love them so far- and i really do like the pop of blue. I just love the colors in your blocks! Great choices! I am LOVING those oranges! mmm I think I agree with the Schultz Family post. I would use the blue in the smaller triangles. I do like all the colors. 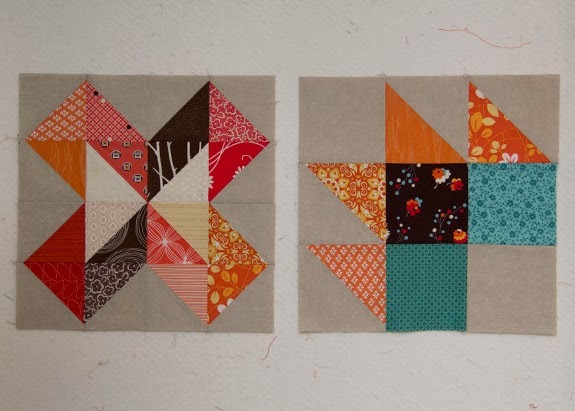 Could you possibly tell me what fabric is the linen-colored one that you are using for these blocks. I don't have a fabric store close to me, I have to purchase online and I've had difficulty finding something similar. Thanks in advance.